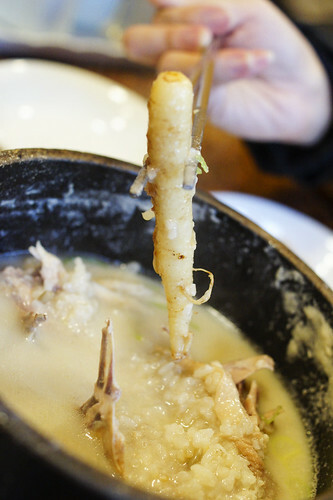 Ginseng Chicken Soup, or otherwise known as Samgyetang (삼계탕), is one of the most well known Korean dishes. 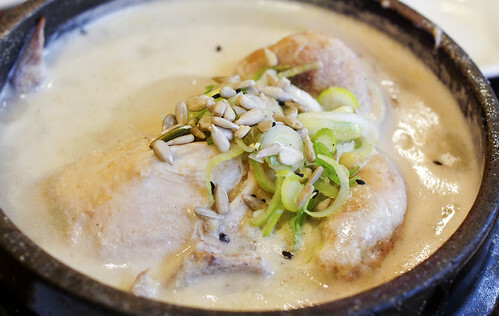 It’s prepared by boiling a whole young chicken that is stuffed with glutinous rice in a broth of Korean Ginseng. Other herbs and spices such as jujube fruits, gingko nuts, garlic, ginger, wolfberry and Danggui (or otherwise known as Angelic Sinensis) or other medicinal herbs may also be added. When people ask about the best Samgyetang in Seoul, the name Tosokchon will always pop up. 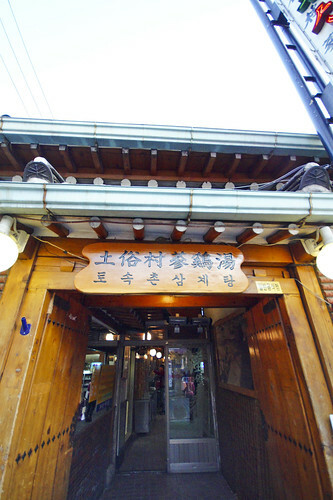 Tosokchon is a restaurant that was converted from a traditional Hanok that is situated near Gyeongbokgung station. Apart from the food, you also get to enjoy the dining experience in a Hanok. Dining areas are divided into rooms with a few tables. Guests are to remove their shoes before entering and the dining will be at the low lying tables. There is no chair, just cushions on the floor. As seen in the photo, it is NOT wise to visit during meal hour. I returned at about 4 pm (on a weekday) and to my delight, the is no queue and I got a seat right away. 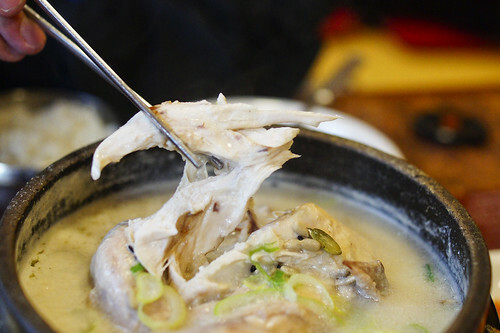 This legendary ginseng Chicken Soup was said to be well loved by a South Korea late president Roh Moo Hyun. 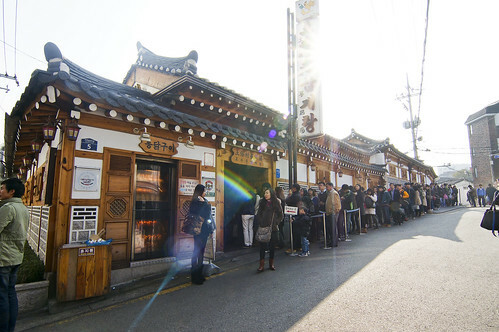 Despite of having a history of only twenty years (comparing to restaurant such as AndongJang, Mabongnim Halmeoni Tteokbokki, Jinokhwa Halmae Wonjo Dakhanmari), they had established a reputation as one of the best Samgyetang in Seoul. Tosokchon uses free range young chicken (no more than 49 days old) and they are butchered and delivered fresh daily, making for only the tenderest meat. 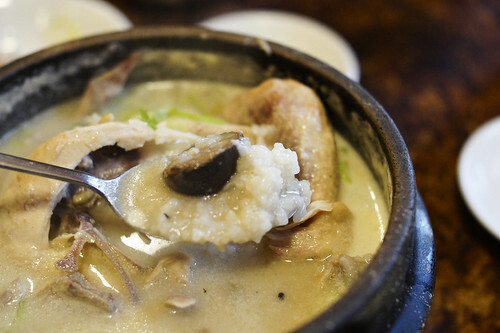 Tosokchon’s Samgyetang is very distinct for it’s rich chicken broth and for it’s strong ginseng taste. Depending on personal preference, the ginseng taste can be a Yay or Nay. Unlike some Samgyetang that only contains a tinge of ginseng taste (or totally none while they still claim that it’s Ginseng Chicken Soup), this one is full of it. Look at the size of the ginseng. The ginseng taste is especially strong in it’s glutinous rice and some may even find it bitter to a certain extend. For those who don’t like ginseng taste and want to have some authentic Korean chicken soup, you may want to try Dakhanmari. The chicken soup is really thick and rich that the broth turned milky instead of a clear broth. I can literally taste the freshness and sweetness of the chicken just by drinking the soup alone. However note that the soup is intentionally lightly-seasoned (I like my soup a little saltier), therefore do remember to add salt and pepper according to your taste preference. The chicken meat is super tender and moist and the meat easily falls off from the bone by just using a pair of chopsticks. Dip the chicken into salt and pepper too if you demand more flavour. By the way, the portion of a bowl of Samgyetang is good enough to be shared by a couple. I found a few Best Samgyetang candidate from online but Tosokchon is the most accessible so I decided to pop by. I can’t decide for sure that it’s the best Samgyetang in Seoul but it’s indeed the best I had. Tosokchon is also frequently visited by Chinese and Japanese tourists so do avoid meal time as much as possible. Did I mention the staff at Tosokchon speaks English and Mandarin? As it’s location is relatively near one of Seoul’s most popular attraction Gyeongbokgung Palace, do pop by to immerse yourself in their Korean dining culture if you happen to visit this attraction. The route to Tosokchon is rather straight forward. Exit from Gyeongbokgung MRT station Exit 2. Walk along the main road for about 200m. 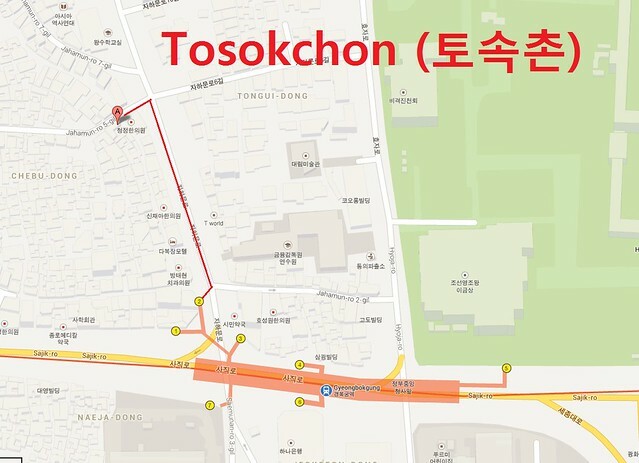 When you reach a cross junction, turn left and you should see Tosokchon.